(L-R) Charles Kie, Managing Director, Ecobank Nigeria Ltd; Serigne Dioum, MTN’s Executive, Mobile Financial Services; Ade Ayeyemi, Group CEO, Ecobank Transnational Incorporated (ETI), Rob Shuter, group CEO of MTN and Patrick Akinwuntan, Group Executive, Ecobank Transnational Incorporated (ETI). 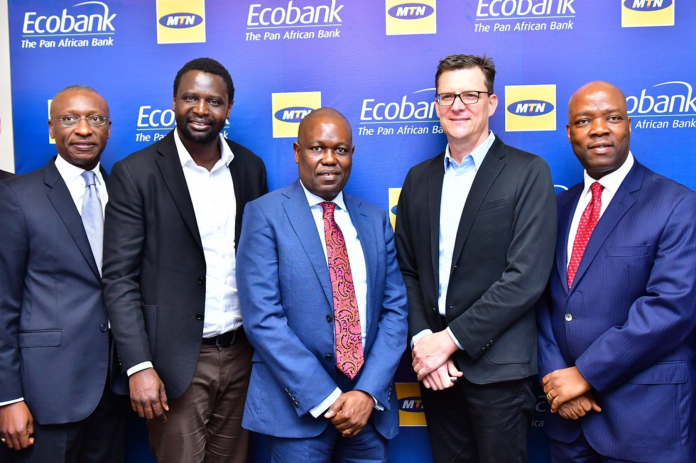 MTN has announced a collaboration with Ecobank Group, enabling both companies to leverage each other’s assets that will ultimately offer more value to their respective customers across the continent. The two entities, with an extensive footprint on the continent signed a Memorandum of Understanding to develop this partnership agreement, which will allow them to innovate and enhance access to affordable financial services via MTN Mobile Money and Ecobank Banking services. Ade Ayeyemi, Group CEO of Ecobank in a press statement said, the changing landscape of digital banking and mobile telephony is creating unique opportunities in the way and manner customers are served. “Africa will need to digitize financial services to rapidly scale up client acquisition and patronage,” he said. Commenting on the collaboration, MTN Group President and CEO, Rob Shuter said partnerships between banks and mobile money operators are fundamental in the mobile money ecosystem, hence their long-standing partnership with Ecobank in many of their markets aimed at driving financial inclusion. “We’re excited to be taking this partnership to the next level as this latest development will spearhead innovative initiatives which will deepen financial access on the continent,” Rob concludes.